The Supreme Court ruling that handed George W. Bush the presidency has triggered an explosion of fury among African-Americans that took many pundits by surprise. And many have yet to fully fathom the depth of black America's outrage. The intensity of the response is being fueled by a combination of factors, but the primary bone of contention is the issue of vote suppression. Widespread charges that Florida's black vote was systematically suppressed, combined with the Supreme Court's ruling to stop counting untallied votes served to remind black Americans that a hard-fought right they supposedly received 35 years ago is still up for grabs. their disenfranchisement was status quo until a long and bloody struggle produced the 1965 Voting Rights Act. Anxiety about vanishing voting rights was on full display two years ago when a false rumor sprinted through the African-American community warning that blacks would lose the right to vote when the Voting Rights Act expires in 2007. Black-oriented talk radio shows and Internet chat rooms were awash in fearful projections of our dire, voteless future. The fearful notion that white Americans can totally disenfranchise black Americans at a moment's notice may be irrational, but it's a fear deeply rooted in the African-American experience. Thus, the shenanigans in Florida struck an ominous chord in black America. "There is a radical difference between the way whites and blacks perceived the election," notes David Bositis, a senior political analyst for the Joint Center for Political and Economic Studies, a Washington think tank that focuses on issues of special concern to blacks. "Black voters are very angry for the most part. In their minds, the election was stolen by Jeb Bush, by George W. Bush and by the Supreme Court. That sentiment is widespread, and I don't think this will be soon forgotten." The Supreme Court's focus on the equal protection clause of the 14th Amendment to the Constitution added another dimension of insult to the controversy for African-Americans. The amendment (one of the Reconstruction-era amendments, along with the 13th and the 15th) was added following the Civil War to expand constitutional protection to former slaves and their progeny. How perverse it is that the nation's top court would now utilize a clause in this amendment to help suppress the votes of the very citizens it was designed to protect. That perversity was given an ironic twist by the silence of Justice Clarence Thomas during the Supreme Court hearings. The lone black member of the court said nothing even to acknowledge the fear and anger of an African-American community still wounded by a history of political exclusion. Many commentators have questioned the Supreme Court ruling on grounds that it was inconsistent, even contradictory, in its reasoning. But reports have emerged that raise serious questions about the Justices' conflicts of interest. Thomas' wife Virginia has been head-hunting for the Bush campaign in her capacities as an employee of the Heritage Foundation, a conservative think tank. An article in the December 25 issue of Newsweek reports that Justice Sandra Day O'Connor was visibly upset during an election-night party when she heard Florida was first called for Vice President Al Gore. The article notes that her husband said they had planned to move back to Arizona and retire, but that she could not retire and allow Gore to appoint a Democrat. Furthermore, two of Justice Antonin Scalia's sons, Eugene and John, work for law firms that represented Bush in the Florida dispute. "The Supreme Court crowned Bush president by their politics, not the people by their votes," the Rev. Jesse Jackson told In These Times. "That's undemocratic on its face. 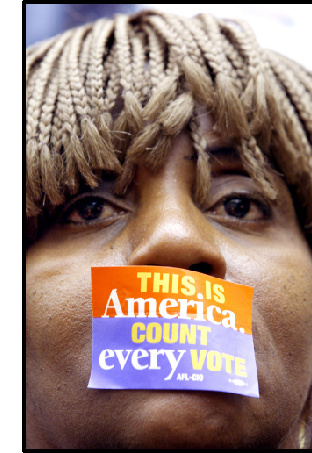 But while the political campaign is over, the civil rights struggle to protect the franchise of our vote will continue." Jackson, who has been a leading figure in the protest surrounding the Florida imbroglio, is planning a series of rallies protesting the actions of Florida election officials and the Supreme Court to be staged across the country during Martin Luther King Day on January 15 and throughout the following week. The protests will culminate with a large demonstration of many groups during Bush's inaugural ceremony on January 20. For many reactionary commentators, like Rush Limbaugh and Bill O'Reilly of the proudly right-wing Fox News Channel, Jackson has become the focus of slobbering anger. Although he has long served as the right-wing's bête noir, his post-election activities have infuriated conservative pundits like nothing in recent years. But Jackson is not the only villain of their story. Right-wing commentators criticized black leadership in general for demonizing Bush. The harshest criticism has been directed at a political ad produced by the NAACP that recalled the 1998 murder of James Byrd Jr., who was killed when two white men dragged him from the back of a truck until his body was torn apart. The NAACP ad featured the voice of Byrd's daughter who said: "When Gov. George W. Bush refused to support hate-crimes legislation, it was like my father was killed all over again." The ad was condemned as too strong even by sympathetic Democrats, but NAACP executive director Kweisi Mfume argued that it was an accurate reflection of the Byrd family's feelings. It certainly proved to be an effective tool in helping to mobilize the black vote. Nine out of 10 African-Americans voted for Gore, an even higher percentage than for Bill Clinton, who was enormously popular among blacks. Even in Florida, where African-Americans make up 13 percent of the electorate, the black vote was 16 percent of the total in this election. Figures on black turnout were comparably high across the country. Political analysts cite the large black turnout for ensuring Democratic senatorial victories in Missouri, Pennsylvania, New York and Michigan. After this belligerent political season, black activists and political leaders are busily preparing an agenda framed by a Bush administration. The Congressional Black Caucus, chaired by Rep. Eddie Bernice Johnson (D-Texas), has already declared its solidarity with those civil rights groups demanding an investigation of vote suppression in Florida. "There will be a far-reaching emphasis on justice in the caucus," says Johnson spokesman Cedric Mobley, "starting with voting rights, ensuring that every vote counts, and ensuring that we never ever have a situation like we have now--where attempts to harass and intimidate minority voters went unchallenged, and where antiquated voting equipment and ballots make it impossible for people to cast legitimate votes." Events surrounding election 2000 have energized the African-American community and many activists see an opportunity to jump-start the stalled but still necessary black freedom movement. With Republicans in control of the executive, legislative and judicial branches of government, black organizers have their work cut out for them. Pundits who are not blinded by the sweat of ideological fervor understand that Jesse Jackson's post-election rhetoric was not just a product of his own hyperbolic tendencies, but an accurate reflection of black Americans' justifiable anger. He understands that African-Americans' anger must be channeled into political challenges to GOP hegemony in the 2002 elections. Black leadership undoubtedly will find it difficult to maintain this emotional intensity for two years, but the judicial coup that gave America President Bush has made the job significantly easier.